Buenaventura Golf Course Hole 2 (left): This short par four requires a drive that stays right of the venerable Eucalyptus tree on the left side of the hole. 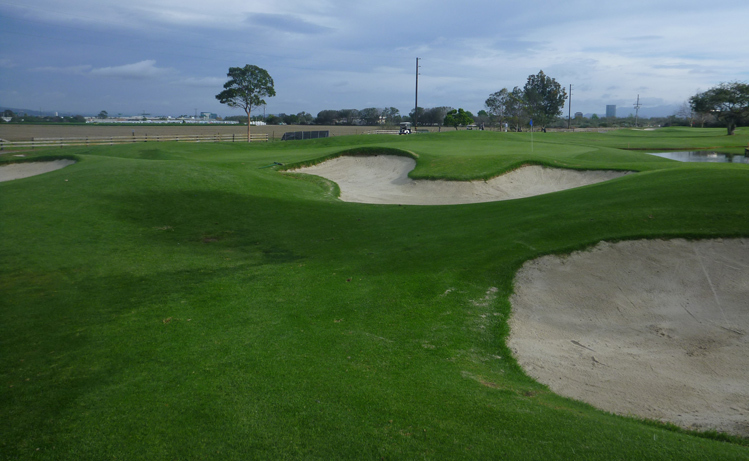 Of course, the deep bunker right and short of the green means the ideal angle is from the left side of the fairway. The green has some severe slopes. Buenaventura Golf Course Hole 3 (below): This short par four is a no-brainer if played safe, but the temptation to leave a short second shot can provide trouble. The tee shot is very tight and anything hit off line will most likely be blocked by very large and unforgiving trees or find its way into many bunkers around the green. Buenaventura Golf Course Hole 5: The best hole on the course is a tricky par three with water short left and long of the green. There is a bunker on the left that the green wraps itself around, so tee shots must be accurate and the distance must be judged correctly or some awkward putts can be had. 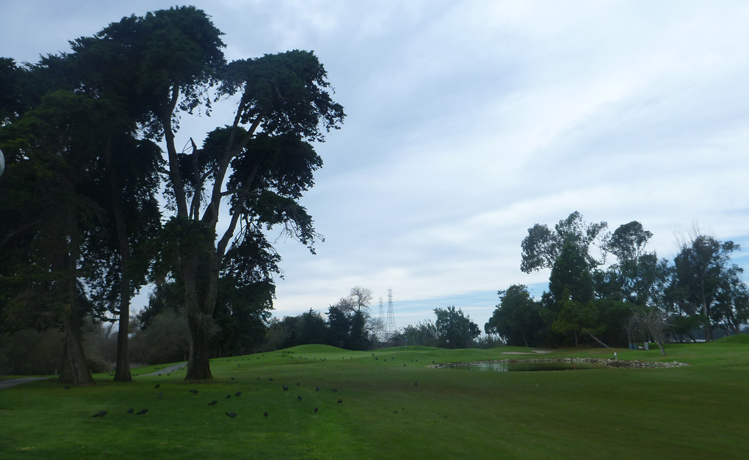 Buenaventura Golf Course Hole 9: The final hole on the front is a fairly long, straight, slightly downhill par four. The key feature is the bunker in the middle of the fairway. The player can go short, left, right, or over it, but must avoid it at all costs. The green also is well bunkered on the approach. Buenaventura Golf Course Hole 10: This is the only long par five on the course, and it is a tough one with OB running the entire left hand side of the hole. The green is fronted by deep bunkers and the sneaky danger is the lake that starts at the middle right of the green and wraps around behind it. Buenaventura Golf Course Hole 13: This medium length par four skirts the back edge of the property and has OB to the left. However, the real trouble here is the lake to the front of the green that must be avoided. For those that are too careful or overzealous, shots going too long will leave, at best, downhill putts or chips, and at worst, a trip to the out of bounds over the green. Buenaventura Golf Course Hole 14 (left): This short par three has a very narrow green in the front, and it widens a bit to the back. However, avoiding the lake right and the bunker left, are absolute musts for a good score here. Buenaventura Golf Course Hole 16 (below): The beast of this back nine has an elevated, straight tee shot, but a big one is needed to afford an easier shot to this elevated and angled green, that has a lake short/right and one hidden behind the putting surface. 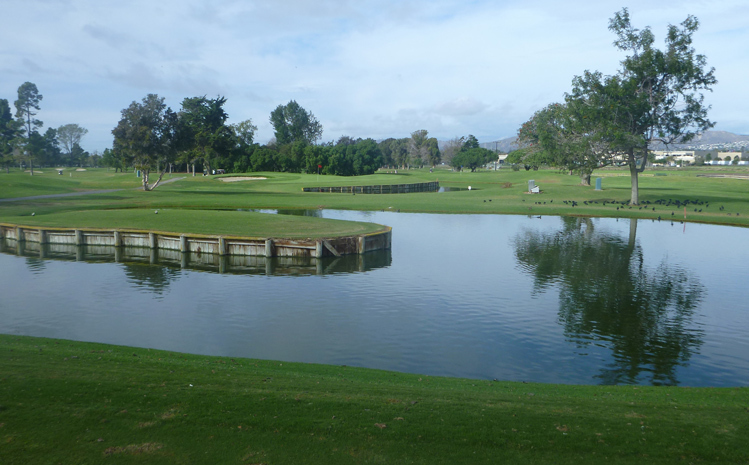 Buenaventura Golf Course Hole 18: The day's final hole is a short par five with a dogleg to the right. A well-placed drive can make the green accessible in two for many golfers. The green is set over water and some bunkers and is much wider than it is deep. It also has distinct levels that can make longer putts tough..